Bring a bus and we’ll make a fuss! Capone's offers a delightfully different group experience at a rate no one can beat! Get a group deal and you've got it made! Capone's offers tour operator, club, corporate, schools and family group plans. All you need is a minimum of 15 adults to get these great rates. If you want your mob to be recognized, you gotta get "made" by our gang. NOTE: For parties of 10 or more there will be a partial gratuity collected at check-in. Character group greeting when your group arrives at the theatre. 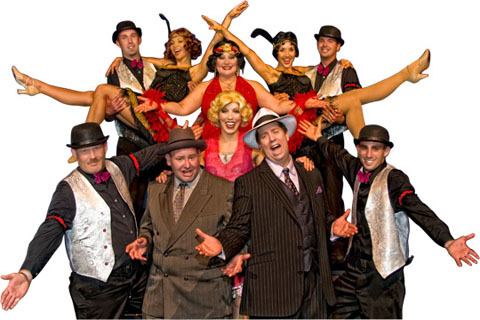 Have one of our goofy mobsters or beautiful dames greet your group and introduce you to our joint. Group recognition during the show. Plus, be sure and let us know if anyone in your group is celebrating a special occasion and we will announce it. Our intimate dinner theater is a unique experience your group won't soon forget! Unlike the huge arena shows, your group won't get lost in a huge sea of seats. Dress-The-Part Costumes - Each member of your group will receive a headband, boa or fedora. Special Occasion Cakes - If your group is celebrating a special occasion and you would like to upgrade your dessert, ask us about special order cakes (48 hour notice required). Corporate Events & Facility Rental - Want the joint all to yourself prior to the show? Combine your visit with a corporate meeting, wedding, award ceremony, baby shower, team building event or other group get-together. Pre-show Hors D'oeuvres - If your group will be arriving early, let us help take the hunger off with some hors d'oeuvres made just for your group! Presentation & Production Services - If you will be renting our facility prior to the show, we offer a number of special services to make your experience even more memorable. Tour Operator Specials - When you bring a bus, we'll make a fuss! We love tour operators and offer a great tour package. "The 44 members of Blue Ridge Pioneers that attended the dinner and show on Wednesday, January 13 thoroughly enjoyed the performance. Our group was seated in a timely fashion and the servers were very courteous. The buffet was plentiful and tasty and the beverage selections quite generous. One of our members was selected to be on the stage and everyone laughed at the humorous antics he displayed. We'd definitely recommend Capone's to anyone wanting an entertaining evening. Thanks for your assistance with the purchase of our tickets." The Orlando area offers many entertainment choices for your groups. The value we provide at Capone's Dinner & Show can add a different type of experience for your group at a steal of a deal. Orlando dinner shows all tend to offer similar plated meals except for Capone's Dinner & Show where we offer a fresh delicious buffet which no one else in Orlando offers. Capone's Dinner & Show is #1 in Orlando for our large menu of both alcoholic and non-alcoholic beverages included with the ticket price.